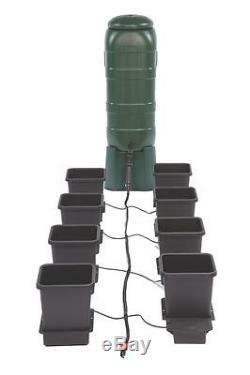 AutoPot are specialists in self-watering systems, with emphasis being strongly placed on efficiency and preservation. AutoPot delivers products that are considered the most environmentally friendly in the world to both domestic, hydroponic and commercial markets. Our systems ensure this claim as the plant uses everything that is supplied to it; there is no loss of water, run-off or leakage! All AutoPot products require NO POWER, PUMPS, MAINS WATER PRESSURE OR TIMERS to operate, GRAVITY PRESSURE IS ALL THAT'S NEEDED from a tank or water barrel. The systems are undoubtedly some of the simplest to use and can be left unattended for weeks due to the capability of the AQUAvalve to deliver all that is required by the plant. AutoPot is now an international market leader in irrigation and hydroponic systems, with an established global reputation for providing durable, environmentally friendly and innovative watering solutions to a range of growing scenarios. From the in your garden to acres of commercial glasshouses AutoPot can provide any grower of any ability with a system, large or small, that will far exceed his or her expectations. Our aim is to provide the horticultural and hydroponic market place with easy to use watering systems that will allow the consumer to grow beautiful plants time and time again. There is an AutoPot system to suit every type of gardener, we have a great success record from the home to one of the UK's largest commercial nurseries. AutoPot systems have been proven to reduce consumption of water and feed by an impressive 40%, whilst increasing yields. With increasing concerns of water conservation and the environment becoming prominent in our lives we are sure at AutoPot that more and more people will realise the advantages of using our self-watering systems. This is a completely new concept in irrigation and one that the horticultural and hydroponic world has been waiting for. We will always send your item either wrapped in black wrap or in a plain cardboard box with no information on. There are surcharges for the following postcodes in the UK. KA 27 & 28, KW 15 to17. PA 20, PA 41 to 49, PA 60 to 78, PH 42 to 44. (Some areas are a two day service). On occasion, but not always the case a re-attempt could be made by the UKMail service. With UKMail the package will remain at the depot for a few days but if the customer has still not contacted them the item will be sent back to us. Based in West Yorkshire, in the UK, The Hydro Store prides itself on being a well stocked hydroponics grow shop, with the best knowledge and great prices, and always striving to provide you with the best possible service. We can offer advice about equipment or any problems you may be experiencing. Your satisfaction is very important to us and we always aim to provide the service and products possible. We are happy to cancel any order that has not been dispatched if directed by the customer making the order. Damages, Shortages and Wrong Items. No reports of damaged items, shortages or wrong items claims after this timeframe will be accepted. The item "AUTO POT 8 POT 15L GROW SYSTEM SELF FEEDING SYSTEM 1OOL TANK HYDROPONICS" is in sale since Tuesday, July 12, 2016. This item is in the category "Garden & Patio\Hydroponics & Seed Starting\Other Hydroponics". The seller is "the-hydro-store" and is located in leeds, West Yorkshire. This item can be shipped to United Kingdom, Austria, Belgium, Bulgaria, Croatia, Cyprus, Czech republic, Denmark, Estonia, Finland, France, Germany, Greece, Hungary, Ireland, Italy, Latvia, Lithuania, Luxembourg, Malta, Netherlands, Poland, Portugal, Romania, Slovakia, Slovenia, Spain, Sweden, Australia, United States, Canada, Japan, New Zealand, China, Israel, Hong Kong, Norway, Indonesia, Malaysia, Mexico, Singapore, South Korea, Switzerland, Taiwan, Thailand, Chile.